Zentel is produced by GSK, which contains Albendazole. It is being used for intestinal parasite treatment. Zentel tablet is in white pentagonal pyramid shape while Zentel suspension is in white orange flavored bottle. It exhibit vermisidal, avacidal and larvacidal activity. 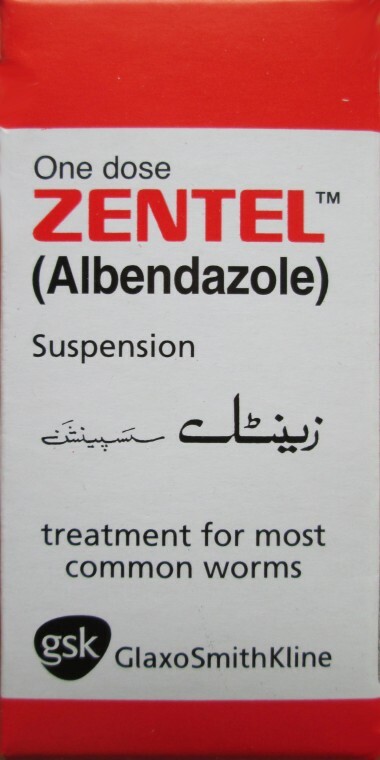 Zentel is being used for intestinal parasite treatment. According to doctors, we have to take intestinal parasite medicine every year, because if they grows up they will be harmful to us in many ways. Therefore we should consult our physician every year to check for these common worms. Cutaneous larva migrans (G.lamblia, G.duodenalis, G.intestinalis, Lamblia intestinalis) in children. 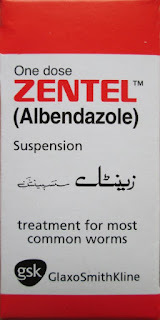 Contraindications: Do not use Zentel, if you are hypersensitive to Albendazole. Zentel in Pregnancy: In order to avoid Zentel in early pregnancy, women of childbearing age should initiate treatment during the first week of menstruation or after a negative pregnancy test. Zentel should not be administered during pregnancy and lactation. Adverse Reaction: Very rare adverse reaction includes erythema multiforme, rashes etc and uncommon reaction includes, headache, dizziness etc. Doctor sahib mujhy Gas aur bloating rehti ha, plus loose stool pass hota, and secondaly bhook itni shiddat sa algti ha jesa kabi kuch ma na khaiya hi na ho aur jism ma shivering hoti, kya wajah ha? Salaam dr kiya ye medicine liver cyst ki liye use kar sakten hain please batain?